Dr. Jack Ridge, professor and chair of the Department of Earth and Ocean Sciences at Tufts University, is working to more precisely understand geologic time in order to create an accurate record of the planet’s climate. 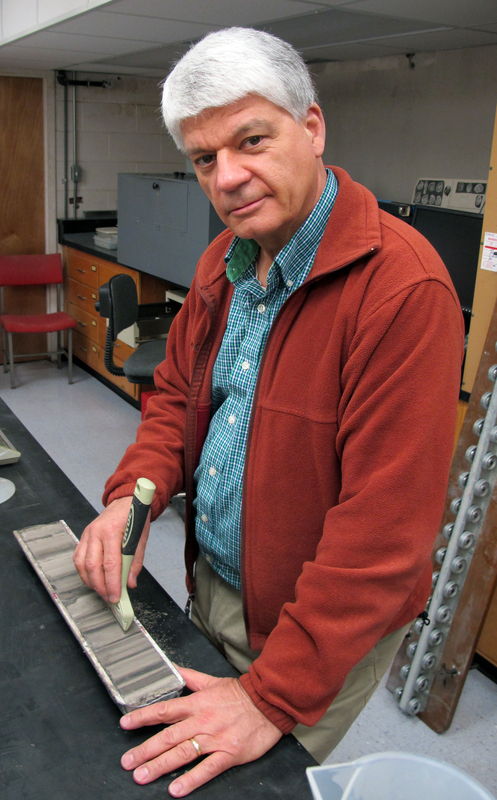 Dr. Jack Ridge‘s research interests lie in the reconstruction of the last deglaciation in the northeastern U.S., primarily as indicated by the annual layering (varves) of sediments from glacial lakes. This work has involved correcting the New England Varve Chronology, calibrating it with radiocarbon ages, and expanding its paleomagnetic declination record in order to correlate varve stratigraphy across a wider geographic area. The main goal of this research is to assemble high-precision (annual) records of terrestrial glacial events in the northeastern U.S. that can be compared to regional and global records of climate. This comparison can be used to test a number of hypotheses regarding the mechanisms for rapid climate change events at the end of the last glaciation and the interactions of terrestrial ice sheets, the ocean, and the atmosphere in the North Atlantic region as they relate to ice age climate. Thus far varve record have been correlated to climatic events and used to test the rates and timing of glacial readvances and ice recession. Varve records and related records of deglaciation and climate in New England are also key factors in understanding the earliest occupation of the landscape by humans and other organisms. For more information about Dr. Ridge’s current research, please go to the North American Glacial Varve Project Website. Geologists are obsessed with the resolution of time. Finding ages for ancient events often involves the radioactive decay of atoms that were included in rocks when they were formed. These ages require careful lab work and have calculated uncertainties related to the precision of lab measurements. Resolving time for more recent events, such as from the last ice age, can employ other techniques that provide us with a more precise estimate. For example, it is possible to resolve parts of single years during the closing phases of the last ice age in the northeastern United States about 19,000-12,000 years ago. This was a time when it was still cold but glaciers were receding in the wake of initial warming climate and there were large glacial lakes that lasted for thousands of years. Glacial meltwater carried sediment into the lakes. This sediment entering the lakes was seasonal. There was a melt or summer season when warmer temperatures melted ice covering the lake surfaces and meltwater from the receding glacier entered the lakes. This left a layer of fine sand and silt on the lake bottoms. When the non-melt season and cold winter temperatures arrived, the lake surfaces froze and very little new sediment entered the lakes. Calm conditions allowed the settling of very fine particles, creating layers of almost pure clay. This happened for thousands of years. Today, we find the deposits from extinct glacial lakes and count the summer and winter layers to determine how many years the lakes existed. We can catalog these layers and create an ice age time scale. However, not all these layers have the same thickness. Years and periods of time that were warmer created layers that were thicker, while cooler years and intervals produced thinner layers. These layers give us a record of varying weather and climate. A climate record with a time scale – who can ask for more!